This is the column where we feature Letters to the Editor. In this space we will answer selected questions from readers or publish letters we receive where people just want to get something off their chest or make their opinion known. We will not publish anyone’s personal information unless we have permission to do so. Reader: Would you mind if I took something you wrote and put it into a voice synthesizer, using the voice of a British woman, and put it on the internet? Briar Report: Not at all. Have at it Old Boy. Reader: I’ve heard you have a special way to pack flake tobacco. Would you please tell me what that is? Briar Report: Thank you for writing, and yes I do have a special technique. I use a, sort of, Frank method modified for flake. There is usually some tobacco in the tin which has been rubbed-out, if not I do so. I put a small pinch of that into the bottom of the bowl, no more than 1/3, but usually about 1/4. I then fold up a flake or as much of a flake that will fill the bowl. I put that in as you would the plug in the Frank method, twisting it as it goes down. I usually push the plug down into the bowl to give myself a little bit of room at the top. Then I sprinkle a little of the loose tobacco on top. The benefits of doing this are; the bottom layer is loose so it promotes good air movement. The plug which takes up most of the bowl burns nice and slow giving you a nice long smoke, which shouldn’t take very many relights. The loose tobacco on the top makes it easy to light. For instance when I do it with Dunhill Navy Rolls, it takes just about two coins with a little left over for next time. I’ve had very good luck with this method. Give it a try. Reader: We notice you website stogiereport.com not have SEO optimize material. We can provide you content articles to get you big traffic. Our writers are waiting to help you. Please contact us [name of company withheld]. 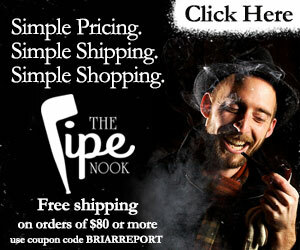 Reader: I’m new to pipe smoking, can you recommend what tobacco I should start with? Briar Report: Welcome aboard. What I would recommend is that if you are near a Brick & Mortar Tobacco Store, stop in and see what they have. Nothing beats actually seeing and smelling blends first hand. They might even give you some to try. Start out with 1 oz. sample sizes while you are trying things out for the first time. 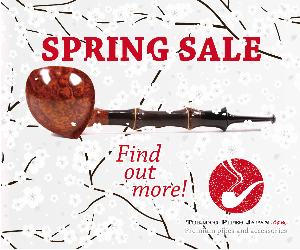 If you are not near a B & M watch some videos on YouTube, especially ones aimed at new pipe smokers. 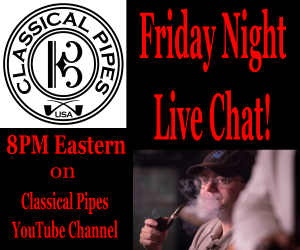 Muttnchop Piper, The Sacred Leaf Society and Tobacco Talk with Ole Berg & John Lofland, just to name a few come to mind although there are a ton of good ones. Learn the different types of Pipe tobaccos. Aromatic, English, Virginia/Perique, for example. Most people start out with aromatics, the most popular being Lane 1-Q. I would also recommend getting some samples of the other types, keeping your choices on the mild side. Orlik Golden Slices, Peter Stokkebye PS17 English Luxury or Samuel Gawith Squadron Leader being good choices. The fun is in finding out what you like best. Happy hunting. Reader: What is your favorite lighter? Briar Report: Thank you for the question. I don’t want to promote one kind of lighter over another but as far as what I like best, I’ll have to shotgun this, sorry. -The one I normally use every day is a Zippo with a butane Thunderbird insert. It has faux scrimshaw of a Tall Ship on it. -The one I have been using most lately is still another Zippo, but one from their new line. The Bolt design. That has the standard Zippo pipe insert in it. -The best one I have is a Corona Old Boy, Gold with Briar Scales. It is a design marvel. I would never put it in my pocket or take it anywhere. I use it exclusively at home. A Joy to use. An honorable mention goes to my Nimrod. You can’t compare it to any other lighter and it’s so fun. If you ever get the opportunity to get one, don’t pass it up.